This article courtesy of the Canadian Athletics Coaching Centre and Human Kinetics. This article is a study in the effectiveness of pretension in lower leg muscles during a sprint start. In the study, the subjects perform sprint starts with varying levels of force applied to the block pedals while in the ‘set’ position. Although the findings do not suggest an advantage for a pre-tensed start versus a conventional start, the study offers an interesting look into the force demands of each method. In summary, the pre-tensed and conventional starts produced similar performance for the subjects in our sample. 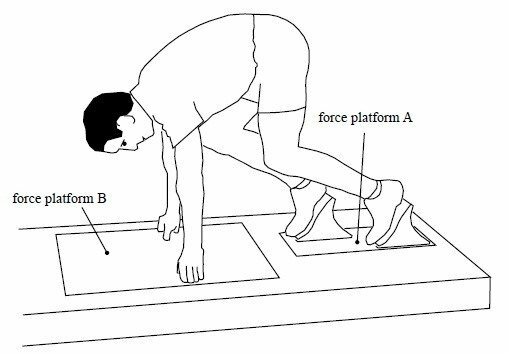 The increased propulsive force exerted through the legs in the early part of the acceleration phase in the pre-tensed starts did not result in a clear-cut advantage because it was counteracted by an increased backward force exerted through the hands during the same time period. 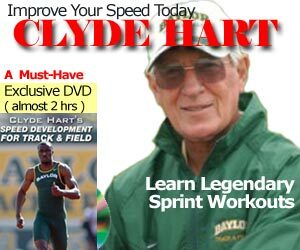 The results of this project do not necessarily imply that both types of start are equally effective for all athletes. Most of the subjects in our sample stated that they normally apply only moderate or small amounts of force against the blocks in the “set” position of their normal competition starts; only 2 of our 19 subjects stated that they habitually apply a large amount of force. It is possible that insufficient expertise in the execution of the pre-tensed start may have limited the average performance of our subjects in this type of start, and that perhaps subjects with greater expertise in both types of start might have performed better in the pre-tensed start. Taking this into consideration, we must conclude that the pre-tensed start is no worse than the conventional start, and that for subjects fully experienced in both types of start it is possible that the pre-tensed start might be more effective than the conventional start.